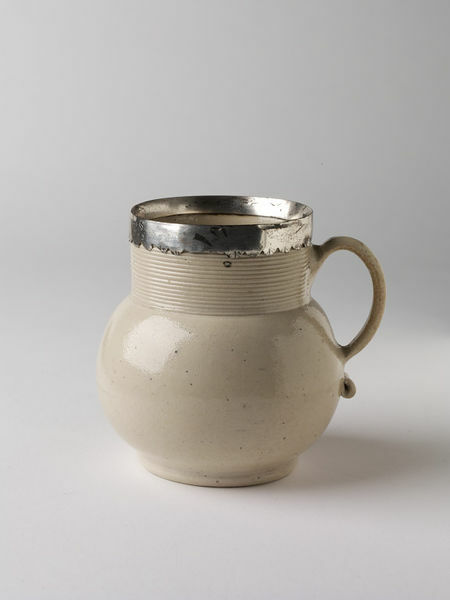 Mug of salt-glazed stoneware with a globular body, wide horizontally reeded neck and grooved lip handle, and the mouth is mounted with a silver collar engraved with the initials 'S S' and the date '1682'. One of two mugs with 414:853-1885 (Sch. II 58). 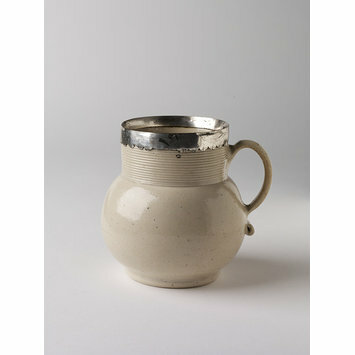 Mug of salt-glazed stoneware with a globular body, wide horizontally reeded neck and grooved lip handle, and the mouth is mounted with a silver collar, made by John Dwight's Fulham Pottery, Fulham, 1862.